I found this while looking around the web for Bigfoot stuff. This person pretty much sums it up, coming from a skeptical standpoint. It has been investigated many times and every single time it fails to stand up to scientific scrutiny. Every decade for the past 50 years there have been prevalent studies done. It's not the evidence analysis that's the problem, it's a complete lack of biological evidence for a creature that has supposedly lived beside man for tens of thousands of years. It's not scientists fault, it's your own fields fault. Pleading for special treatment in wildlife studies doesn't help. Why should science stop everything (cures for diseases, renewable energy, medicine, technology, preservation, etc.) to go all out on a search for a monkey man that has crumpled under scientific scrutiny for the last 50 years? Maybe if the field actually produced biological evidence in the last 50 years, maybe if they provided fossils, maybe if they provided a high resolution motion capture, but no...it hasn't. But we're supposed to believe there is a viable breeding population of gigantic primal hominids nationwide...scratch that...worldwide when not a single piece of credible scientific evidence has ever been submitted? That's even without providing provenance for the sample! We're to drop everything over some stories, legends, misidentifications, hoaxes, and straight up lies? 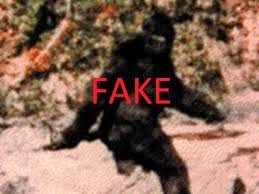 Editors note: We need better evidence people if we are ever going to attempt to prove Bigfoot as a species. To some it probably doesn't matter, they are content knowing in their mind they exist. But to others, I think the goal is get to the bottom of this mystery. Are we getting any closer to that goal? Sometimes it feels like we're just spinning our wheels..
Related post: Bigfoot Breeding Population?